Believers, the One True God, the Supreme God is our God and He will forever guide us daily. He, in the form of the Holy Spirit indwells us and guides us to all truth and leads us to right paths. David said of God in Psalm 73:24 : You will guide me with Your counsel, And afterward receive me to glory. Isaiah in 58:11 said: The LORD will guide you continually, And satisfy your soul in drought, And strengthen your bones; You shall be like a watered garden, And like a spring of water, whose waters do not fail. Jesus said in John 16:13: However, when He, the Spirit of truth, has come, He will guide you into all truth; for He will not speak on His own authority, but whatever He hears He will speak; and He will tell you things to come. 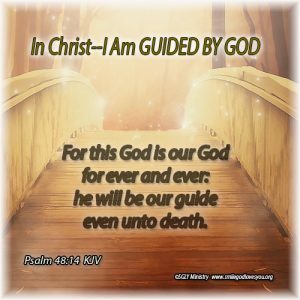 So, believers, we can be sure we have a Guide who will lead us daily forever, for He is God, the Spirit of truth, who is with us always.